The Fijian Pre-Schools projects are an ideal example of Auckland based Rotary clubs working together and matching up with an Island club to complete much needed and valuable multipurpose community assets. In conjunction with the Taveuni Island Rotary, Pakuranga Rotary has been the lead and coordinator for building five preschools over the past 10 years, two in the village of Naselesele, one in the village of Bouma, both on the island of Tavueni plus one each on the islands of Rabi and Kioa. 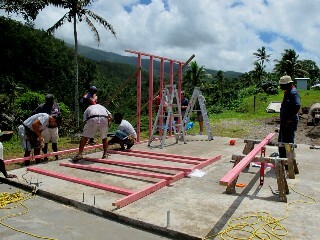 Pakuranga Rotary designed, arranged funding for and coordinated the construction of the preschool classrooms in those island villages. The design and specification work was completed by Stuart Thompson and the completed school rooms are multipurpose also being used as village meeting halls, housing and as refuge centres in cyclones. Stuart Thomson, a member of Pakuranga Rotary authored a book called “Building for Cyclones” and It is pleasing to report that in the recent Cyclone Winston none of these buildings sustained any serious damage. What is not well known is that the funding package for these projects includes the training of two local women to become qualified preschool teachers. The outcome is the availability of qualified teachers to effectively manage the preschool on a daily basis for the benefit of local children and providing meaningful employment for local women who otherwise would be unemployed. The selected candidates also complete a two year Preschool Teachers Training correspondence course to qualify for Fiji Ministry of Education payment of preschool teachers. For each project two young married local women were selected by the women's preschool committee based on their school academic records, their interest and enthusiasm for preschool teaching and their ability to work with young students. Objective 1: Empower the existing women’s preschool committee with clearly established duties and responsibilities to enable them to take ownership for the overview of the construction of the preschool buildings and, on their completion, to effectively manage and run the preschool educational facilities through the establishment of financial and management procedures. Objective 2: Training of local women to become qualified preschool teachers to be able to effectively manage the preschool on a daily basis for the benefit of local children as well as providing meaningful employment for local women who otherwise would be unemployed. To provide early childhood education training and skills for village women. To facilitate the engagement of trained women teachers to fill positions following the construction of facilities. Also, to empower other women to begin similar early childhood education facilities, day care centres and preschools in their own villages and communities. Historically, most women have had no viable income, lacked education in early childhood development and had little opportunity to send their own children to higher education. Qualifications empower the local women thus creating opportunities for employment, motivation for continued education and improve village children's success in school. Objective 3: Establish a permanent preschool providing for 30 children in a morning session and 30 children in afternoon session thus giving 60 children preschool each day. Objective 4: To empower selected young men from the village with the opportunity to participate in the building program and thus learn new trade skills to give them better opportunities for future employment. 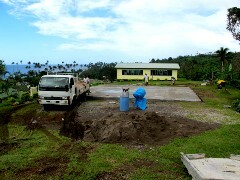 Five young men from the village were selected to assist with the construction of the preschool buildings. Under supervision, the young men were trained in building, plumbing and painting methods with the construction of the preschool building providing practical application. Erection of the pre-cut building frame work, cladding, gables and roofing. On arrival visited the Village Chief to satisfy the local custom and to seek his approval to enter the village and carry out our task then taken to the site by a local taxi. 3-tonne truck with the first of the timber arrives and is unloaded onto the site. 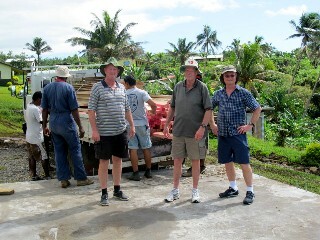 We are met by quite a number of local people who helped with the unloading, and took to the building tasks with great enthusiasm. Scheme out how we were to undertake the project. 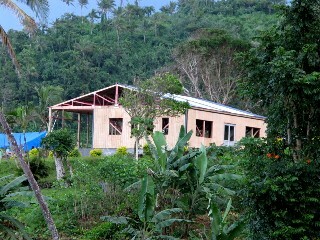 At close of play on the first day, the framing of the classroom is almost complete. The ladies of the village then arrived with a delicious late afternoon feast. It was raining when we arrived on site, but not enough to dampen our enthusiasm to get going. 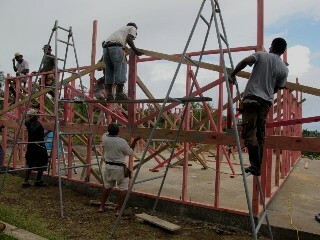 Goal for the day was to finish the frames and install the four main trusses. We managed to achieve this objective, but several tropical storms during the afternoon lashed the site and made it quite difficult. Undoubtedly, it was a successful day, especially when the village ladies, once again provided an end-of-work tea party. Today's goal: To finish the frames and window placements, finish installing the trusses and begin to install the wall cladding. The weather today is very hot and humid, with very little wind. Afternoon tropical storms are a given. However, we achieved our target. 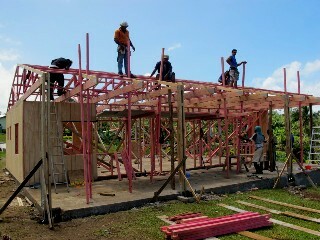 The roofing timbers are almost complete, and the roof should be on by tomorrow night. We should also have finished most of the cladding by then. Ladies from different parts of the village take it in turns to put on the tea party. We find out that the ladies who catered for us today walked for 40 minutes from their homes carrying trays of home-baked delicacies and kettles of hot water for the tea. The drive up the hill to the local village has taken on a new perspective with the new Pre-School building becoming a prominent landmark. The roof is not yet on, but is set to happen first thing tomorrow. 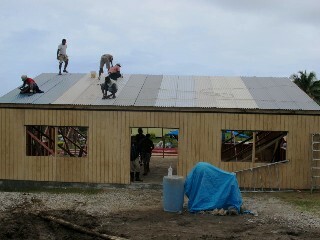 Three sides of the building are fully clad, and the front should be complete by late morning. The cladding turns an empty skeleton into a solid building. It makes a huge difference to the skyline and will be a central part of Village life. Tomorrow is our last day. The tasks needed to complete include finishing the cladding, getting the roof and (possibly) the flashing on, and fitting the doors. Today was our last day on the project, so it was necessary to prioritise the outstanding tasks and only leave incomplete the tasks that can easily be taken over by the local team under the direction of the local Rotarians. The wall cladding is completed, work began on fitting the roof sheets, the front and rear doors were installed and look magnificent. Another local team built shutter boxes to cast concrete to anchor the front veranda pillars. By lunchtime the end is in sight and the Rotary team press-ganged a local into taking us to the famous local waterfall for our picnic lunch. After our picturesque lunch we completed as many of the outstanding jobs as possible. Our deadline was 4:00pm to finish the project at which time the ladies of the village were to give us a farewell feast. Thanks were expressed to the various members and each of the team members was adorned with a beautifully crafted "Lei", a floral necklace. There is very little left to do. The window frames need to be trimmed then fitted with louvers. The clear sheeting needs to be fitted to the end trusses. The remaining two of the front veranda anchor boxes need to be cast, floor tiles laid, painting and the construction of the toilet and associated plumbing. We can reasonably conclude that our work was not only done but done very well, very safely, and very satisfyingly. In the end it is important to add that the team actually takes away more than had been contributed by way of many fond memories and the huge satisfaction of a job well done and vital new assets provided that will benefit the entire village community for decades to come.